In a competitive market, some buyers walk through the home with an inspector before making an offer on the home. This gives them the confidence to formally waive the inspection contingency when they make their offer, possibly putting their offer in a stronger position to be accepted. However, a home inspection may identify the need for major repairs or builder oversights and minimize unpleasant surprises or unexpected difficulties. Traditionally, an offer on a home includes a standard inspection contingency and the buyer hires an inspector once the offer is accepted. What will the home inspector look for? These are some of the things a typical home inspector will check, according to the American Society of Home Inspectors. The HVAC System. This includes installed heating equipment, vent systems, flues, chimneys and distribution systems. The inspector is not required to inspect interiors of vent systems, flues, and chimneys that are not readily accessible, heat exchangers, humidifiers, dehumidifiers, electric air cleaning and sanitizing devices, heating systems using ground-source, water-source, solar, and renewable energy technologies, heat-recovery, or similar whole-house mechanical ventilation systems. Plumbing. No one wants to find a leaky pipe their first year in their new home. The inspectors will inspect many aspects of the pipes and plumbing system. This includes interior water supply and distribution systems including fixtures and faucets. Interior drains, waste, and vent systems. Water heating equipment, hot water supply systems, sewage ejectors, sump pumps, accessible vent systems, flues, and chimneys are included. The inspector is not required to inspect clothes washing machine connections, interiors of vent systems that are not readily accessible, wells, water pumps, and water storage related equipment. Structural, foundation, basement and attic. Inspectors will generally look at the structural components including the foundation, framing, floors, walls, ceilings, and roof structures. Your inspector will check the foundation, basement or attic where accessible. They are not required to enter under-floor crawlspace areas that have less than 24 inches of vertical clearance between components and the ground or that have an access opening smaller than 16 inches by 24 inches or attic load-bearing components that are concealed by insulation or by other materials. Insulation and exhaust systems. The inspector will look at insulation and vapor retarders in unfinished spaces, ventilation of attics and foundation areas, kitchen, bathroom, laundry, and similar exhaust systems, but is not required to disturb insulation. Electrical. 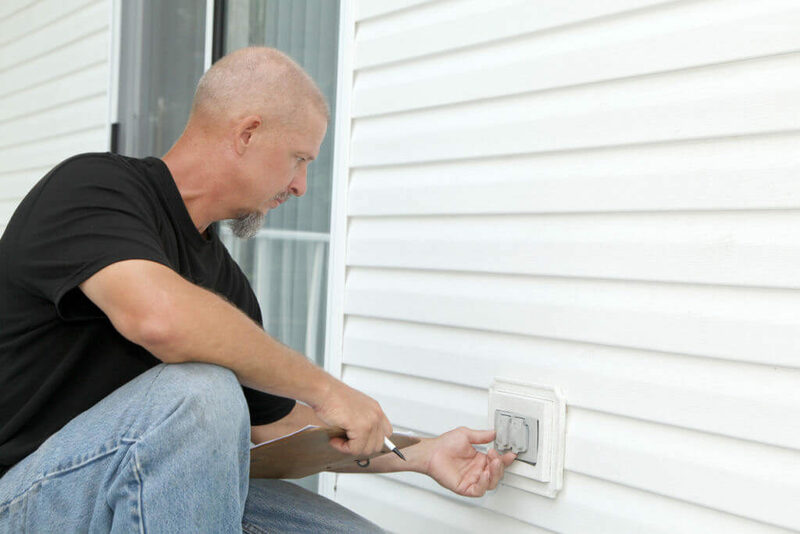 The home inspector checks electrical service drop, service entrance conductors, cables, raceways, main disconnects, grounding, service panels, installed lighting fixtures, switches and receptacles. They are not required to test smoke or carbon monoxide alarms, security systems, or renewable energy systems such as solar. The roof. They’ll check the roofing material, roof drainage systems, flashing, skylights, chimneys, and roof penetrations. They are not required to check the interiors of vents, flues, and chimneys that are not readily accessible or installed accessories on the roof. A home inspector won’t be able to report on below-ground features like the septic system or well. You’ll need to hire a specialty inspector for those. A home inspector also can’t report on hidden, inaccessible problems, like mold inside walls. What should the buyer do during a home inspection? If you choose, you can be present during the inspection. This is a great time to ask questions, but stay out of the inspector’s way and let him/her focus on the job at hand. Whether you attend or not, the inspector will give you a written report of the findings within a few days. The report will almost certainly include problems that were discovered. That’s normal. Hopefully, the list will be minor issues that the seller is willing to fix, or the seller will offer a concession. What you’re looking for are problems that are serious enough to cause you to think twice about purchasing the home for the agreed-upon price. If an issue is discovered, you may be able to renegotiate the purchase price or discuss other options with your realtor. Now that you know what to expect from the inspection process, get prequalified to find out how much of a loan you might be approved for so that you can start looking at homes in your price range. This entry was posted on Wednesday, February 6th, 2019 at 6:00 am	and is filed under Home Buying Process. You can follow any responses to this entry through the RSS 2.0 feed. You can skip to the end and leave a response. Pinging is currently not allowed.